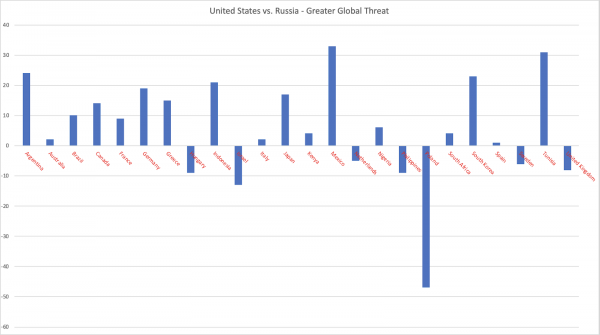 HomeViewsColumnsWhich is the Greater Threat Russia or the United States? 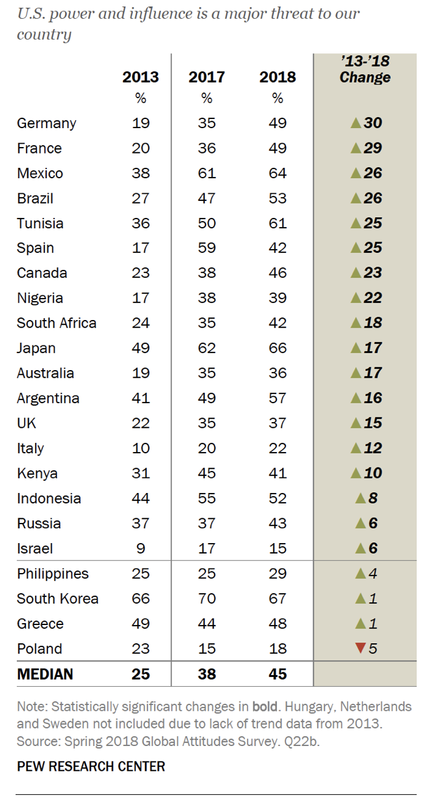 In Pew Research Center’s most recent Global Attitudes and Trends, Pew looked at how 26 nations around the world viewed threats to the globe. While the authors of the study looked at many threats including climate change, ISIS, cyberattacks, North Korea’s nuclear power and the global economy, they also looked at two threats which I found particularly interesting given the seemingly endless growth of diplomatic strains between Russia and the United States. 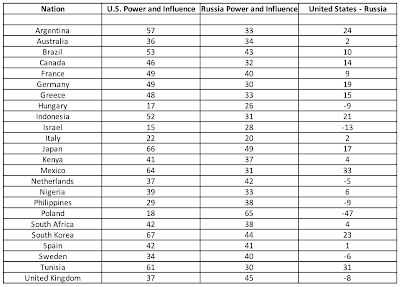 In this posting, I would like to provide you with data for all 26 nations comparing the percentage of people that feel that American power and influence is a major threat to their nation compared to the percentage of people that feel that Russia’s power and influence is a major threat to their nation. 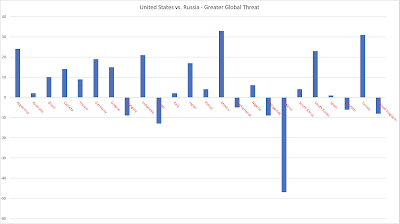 As you can see, when the results from the United States and Russia are compared, respondents from 17 out of 26 nations believe that the United States is a bigger threat than Russia (albeit, three nations show only a one or two percentage point difference between the two) and 7 nations believe that Russia is a bigger threat than the United States. 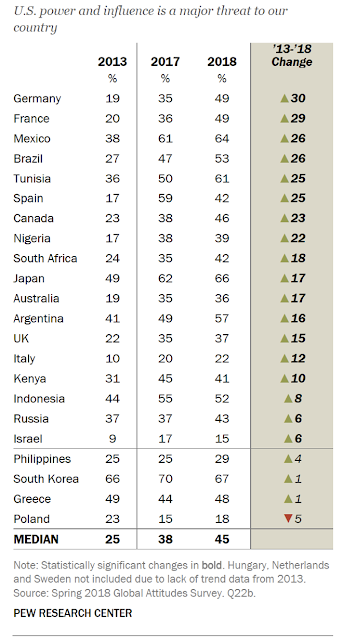 When looking at the individual results, it is interesting to see that a very substantial 67 percent of South Koreans believe that the United States is a major threat to their security compared to only 44 percent who believed that Russia was the major threat. Two-thirds or 66 percent of Japanese believe that the United States is a great threat compared to only 49 percent that believe Russia to be a great threat to their nation. Lastly, even though Germany is ground zero for a Russia vs. Europe war, 49 percent of Germans believe that the United States is a major threat compared to only 30 percent who believe that Russia is a major threat to their national security. 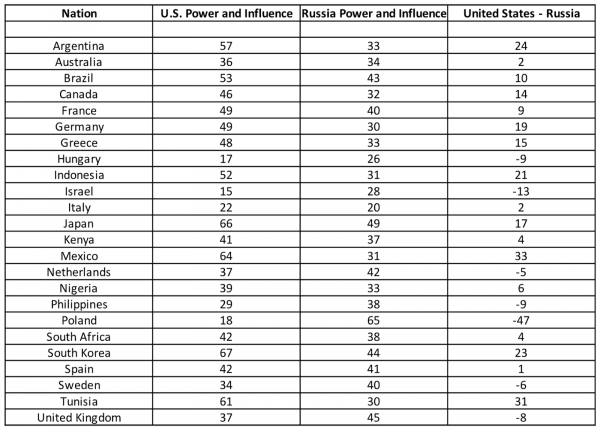 Despite what Washington would have us believe about the Russian Bear and Vladimir Putin, these numbers tell us a great deal about the current state of the world and its relationship with the United States.